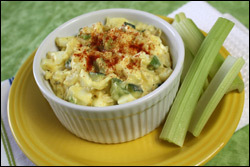 Our super-creamy salad is lighter in labor AND lower in fat than traditional deviled eggs... Weeee! Place cauliflower in a large microwave-safe bowl with 1/3 cup water. Cover and microwave until soft, 6 - 8 minutes. Once the bowl is cool enough to handle, drain any excess water. Transfer half of the cauliflower to a blender or food processor. (Set aside the bowl of remaining cauliflower.) To the blender, add mayo, cheese wedges, mustard, paprika, salt, and black pepper. Puree or pulse until blended. (Don't worry if it isn't completely smooth.) Set aside. To the bowl of non-pureed cauliflower, add all remaining ingredients. Gently stir. Add puree from the blender and lightly stir to coat. Cover and chill for at least 1 hour. Serve it up and, if you like, garnish with additional paprika. Enjoy! HG Tip: Click here for the how-to on hard-boiling your egg whites!